Pets can harbour the hospital superbug MRSA and it can pass between pets and their owners, research suggests. Cats and dogs have the same strain of the bacterium as people, genetic tests show. MRSA may spread between animals at veterinary clinics in a similar way to hospital infections, according to scientists at Cambridge University. But they say pet owners should not worry as there is very little risk of them getting ill from their pets. 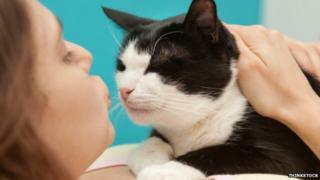 Scientists at the University of Cambridge sequenced the bacterial genomes of samples of MRSA from 42 dogs and four cats. They compared the animal samples to a global collection of human ones. They found the animal strain belonged to the same family as the human form of MRSA found in hospitals. Dr Mark Holmes, senior lecturer in preventative veterinary medicine at the University of Cambridge, said the study showed humans and pets could exchange and share MRSA. "They pass it backwards and forwards - they are a reservoir of infection," he told the BBC. Risk factors for pets include contact with human carriers and going into veterinary clinics. But healthy animals were unlikely to pick up MRSA from their owners, said Dr Holmes. And he said pet owners should not worry about their own health as symptoms of MRSA in pets were "not common". "MRSA infection in cats and dogs is still extremely rare," he said. "There is very little risk of owners getting ill from their pets." Prof Alan Johnson, a consultant clinical scientist for the health body Public Health England said the research reinforced previous data suggesting MRSA could be shared between humans and pets. "While the authors state that animals may be a reservoir for human infection, the converse may also be true, with humans passing MRSA to their pets," he said. "Further prospective work is needed to examine pet-to-human versus human-to-pet transmission." The research is published in the journal of the American Society for Biology, mBio.